Well we eventually returned home on Monday evening after an eventful journey. Now those who know Terry Brown will agree that he is laid back in most circumstances. When Terry starts to show some anxiety all my intentions to stay cool go by the wayside. After sitting in the VIP lounge (yes you read correctly) for some time after our flight was due to board we went in search of it outside on the apron, only to be told that it was the aircraft just taxiing for take-off. After recovering from that shock we returned to the standard lounge to be informed that it had not been our aircraft at all! What chaos!!!! We arrived in Addis and eventually and (after much frustration and shouting at the Ethiopian Airlines ground manager – another long story) we managed to get to a transit hotel. Apparently because our flight was late again the driver got fed up and gone home. The rest of the onward journey to London and then Manchester was uneventful in comparison. In my thank you email to our members in South Sudan I had to apologise if, at times during the week I wasn’t my normal self. After suffering with a stomach problem I felt nauseous all the time. The good news is that I lost 6lbs in weight! However, I’m pleased to report that I was able to eat my normal “return from abroad” meal – egg and chips prepared of course by my lovely Chief Wife. Thank you so much to all our members in Juba for their hospitality and friendship during the week. I was so pleased to meet some old (well young) friends who I’ve known for many years as a result of my visits to Khartoum. It gave me much pleasure to see the incredible progress made by some of the “boys” we have looked after, trained and encouraged. Many now hold senior positions in the South Sudan civil service and private sector. This provides evidence that what we are delivering through these programmes is working and is having an impact on the lives of many; what I find incredible is the story of Ding who was one of the boys at our farm in Buri, Khartoum and is now repaying our Society by providing the same opportunity for other boys by renting a house and looking after 14 boys at his own expense! I can’t let this opportunity go by without repeating my grateful thanks to Mama Lucy our highly respected President of Juba SVP Central Council who quietly and without thought for herself carries on the work of helping the poor on a one to one basis in a way that we all respect. What she does is at the core of Vincentian work and I’m pleased to see that this is growing from strength to strength in South Sudan as recognised by the Archbishop. Time to reflect on the last 10 days. Tomorrow I’ll write my final blog in this series with my thoughts and conclusions. For readers who aren’t fully aware of the St Vincent de Paul Society (SVP) we are an international charitable organisation active in 149 counties throughout the world. 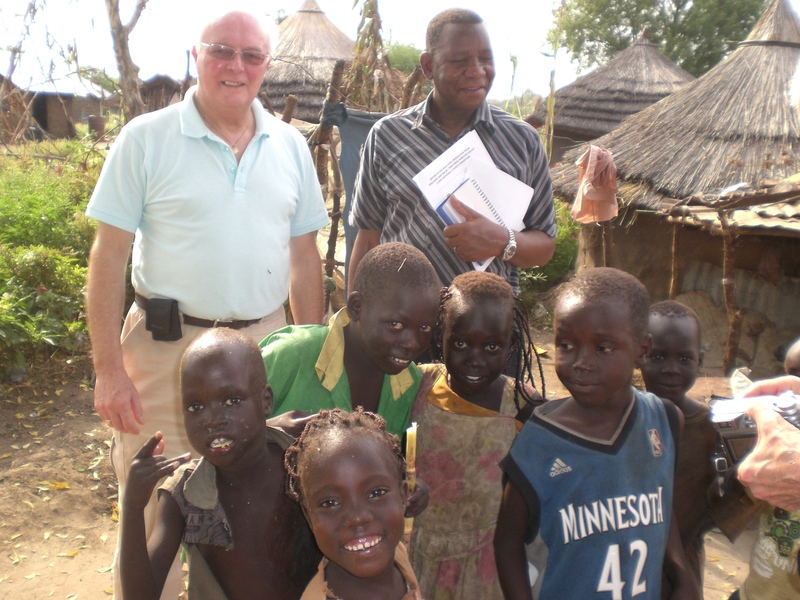 I’m visiting South Sudan as a member of the SVP (England & Wakes) International Twinnage Committee responsible for Sudan. I’ve visited our members in Khartoum many times in the last 13 years but, up to now it’s been considered unsafe to visit South Sudan. Sudan’s civil war is similar to that which we now see in Syria – the southern rebels fight with the Khartoum Government dominated life since 1956. Amnesty International report that 2 million people have been killed and 4 million people were displaced from Southern Sudan to the North. The peace agreement signed on the 9th January 2005 resulted in the formation of South Sudan on the 9th July 2011. Some of the displaced people are now beginning to return home. Our hosts are the SVP South Sudan Central Council President Lucy Akello, who is taking us to see some of the beneficiaries; the main work of the SVP, as in England & Wales is carried out on a one to one basis by our members. Our other host is Dr Betram Kuol who is responsible for the major support Programmes which help many tens of thousands of people. These programmes are Vocational training, Medical clinics, and Baby feeding. The first thing that hit me was the sharp contrast in the landscape. Compared to the sub-Saharan desert of the barren north, South Sudan is green. However, the picturesque round mud brick houses with straw roofs only serve to hide abject poverty. In the first village we visited today we were told that some of the villagers couldn’t go out into the surrounding fields because of land mines – in fact 5 people were killed only 3 weeks ago. However the community spirit is absolutely incredible. We live in what could be called a reasonably affluent area; the houses have long drives and as a result we rarely see neighbours. In the village we saw today people live in close proximity to each other. They share their possessions and even cook for each other. I’m not going anywhere the question “What would I choose if I did have the choice?” but it does make you stop and think!! !